Another traditional media company has invested in an online property to help expand its digital footprint and capture the next generation of consumers. Refinery29 — the online publisher that, in its own words, is aimed at “a modern woman’s destination for how to live a stylish, well-rounded life” — has raised $45 million in funding led by Turner, the Time Warner broadcasting giant that owns TV channels like CNN and the Cartoon Network, but also online sites like Bleacher Report. Also participating: another oldie from the media landscape, Scripps, via Scripps Networks Interactive, which co-led the company’s last round with WPP, a Series D of $50 million at a $290 million valuation. This latest funding round is a strategic investment that will help both sides. The two companies say they will “work together on content creation and development tied to key programming across the Turner networks that will appeal to Refinery29’s core audience of millennial women. They will also work on ad sales together — a key component, considering the shift that media buyers have made to cross-platform campaigns that can target consumers wherever they happen to be looking (with many of those gazes now happening on smartphone screens). Refinery29 can use the investment to reach more consumers that are already Turner viewers, and Turner can use it to tap into the base of users who may look at Refinery29 content, but have more or less stopped watching the kind of linear TV that Turner churns out. “In order to achieve success in today’s quickly evolving digital environment, we believe in partnering with brands that have distinct voices and loyal, engaged audiences,” said David Levy, president of Turner, in a statement. Refinery29 has been around for more than a decade now, launching first in 2004 as a local shopping guide before expanding out into more lifestyle publishing and adjacent branded content as a route to monetizing. While it’s continuing to grow, a lot of that growth is happening away from its actual website. Today the site says that it has over 27 million monthly unique visitors; but that is not much of an increase on April 2015, when it had 25 million monthly uniques. However, the company is growing with the times, so to speak, spending more effort (and now investment) on building its brand on other platforms. Refinery29 itself likes to point out that its reach has grown by 226% since April 2015, now reaching over 225 million users “across platforms.” It doesn’t specify which but I’m guessing that they include social platforms like Facebook, Snapchat, Pinterest and Twitter. It’s been working on a number of original content initiatives as part of this, such as R29 Originals for video, and it has launched regional sites in various international markets such as Germany. To date, Refinery29 has raised $125.4 million, with other investors including Stripes Group, Floodgate, Lead Edge Capital, First Round Capital, Lerer Ventures and Hearst Corporation. For Turner, meanwhile, this is not its first online investment by some measure, among those that have been disclosed: the company’s strategic stake in Mashable, and other in the online video company Above Average. Other large media companies that have dived into digital media include Comcast/NBC Universal, which invests in Vox Media; and Disney, A&E and 21st Century Fox, which invest in Vice Media. As part of this round in Refinery29, Christina Miller, president and general manager of Turner’s Cartoon Network, Adult Swim and Boomerang, will take a seat on Refinery29’s board of directors. 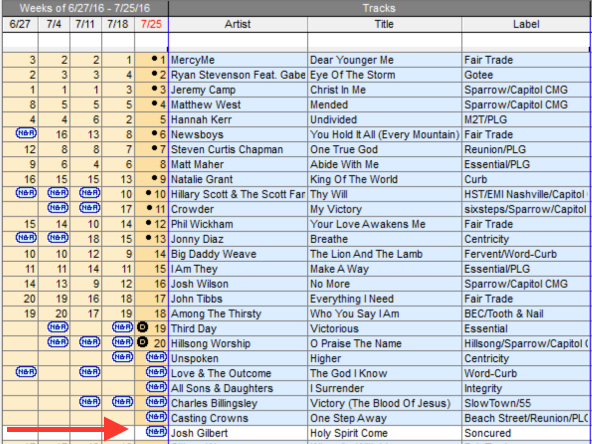 Josh Gilbert back on Billboard Christian Soft AC Charts! 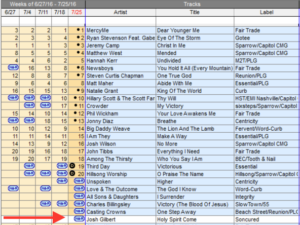 East Tennessee based worship leader Josh Gilbert returns to Billboard Christian Soft AC charts with his new radio release, Holy Spirit Come! This truly inspirational song comes at a time for our country and this song comforts the fears many have. With lyrics like, “Holy Spirit Come, bring life to the dead, work your miracles in our life by your hands” the song reminds listeners that we serve a mighty miracle working God! The most increased spins on Billboard Christian Soft AC charts last week! We are praying that Josh’s new song will hit the Top 20 on Christian soft AC charts but with so many good songs out right now it will only happen through prayer. Last week Holy Spirit Come had a huge increase in radio spins and listeners continue to request to hear the tune more often. Please join us in believing that this song will reach as many listeners as possible, any thing is possible with God! Billboard Christian Soft AC Charts! Holy Spirit Come moves up on Billboard Christian Soft AC Charts!! We are excited about the future of Soncured Records and our artists, stay tuned for more new music from Calling Glory, Tanner Clark and new artist Asher. Our hope is to have Josh back in the studio early 2017 as we continue to focus on his strong song writing ability’s. Josh is an anointed worship leader and God continues to give him new songs that we are certain others will love singing to our Lord. Soncured has new radio releases scheduled for later this year and the first part of 2017! As always, To God Be The Glory!